U.S. Chamber of Commerce President and CEO Thomas Donohue filled dual roles, taking the podium as keynote speaker and co-chairing Miami’s 6th International Economic Forum of the Americas' World Strategic Forum on Monday and Tuesday. Donohue, who organized the event in tandem with Enrique García Rodríguez, Development Bank of Latin America (CAF) president, has contributed toward the increasingly successful influence of the U.S. Chamber of Commerce since taking the helm in 1997. Envisioning exponential growth of U.S. exports and initiating a long-term plan for large-scale free enterprise, Donohue launched the chamber’s campaign and slogan, “American Free Enterprise. Dream Big.” Under his tutelage, the chamber has grown into a virtual political entity, working for tax cuts, job site and environmental regulations, and consistently lobbying for the American worker. Donohue also founded the U.S. Chamber Institute for Legal Reform to establish a presence in the nation’s courts. The U.S. Chamber of Commerce works closely with its law firm, the National Chamber Litigation Center, to represent the workforce in the judicial system. The chamber’s leader has been instrumental in the doubling of U.S. exports over the last five years together with increasingly effective capital markets and strategies for energy, health care, education, and intellectual property rights. Donohue sits on the boards of Union Pacific Corporation and Sunrise Senior Living Corporation, and also serves as president of the Center for International Private Enterprise, an initiative of the National Endowment for Democracy. Want to get notified whenever we write about U.S. Chamber of Commerce ? 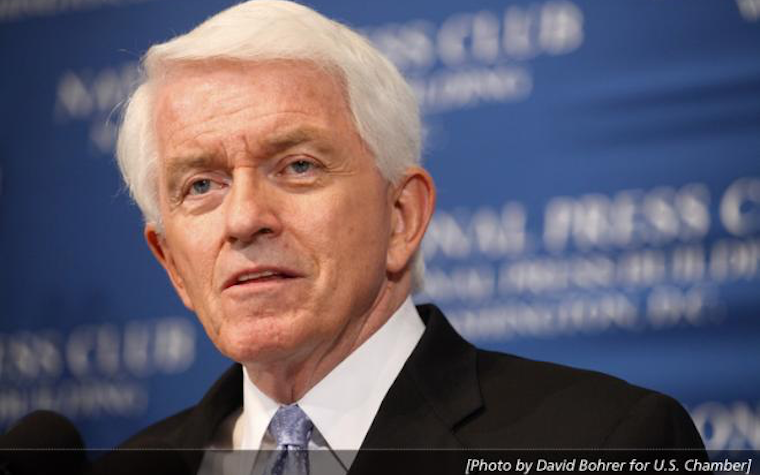 Next time we write about U.S. Chamber of Commerce, we'll email you a link to the story. You may edit your settings or unsubscribe at any time.